When I ask survivors what they remember most about the flood of 1972, it’s almost always the smell of the mud and water during cleanup following the disaster. However, there was so much of our own community that was impacted and often those stories go untold in the larger picture of the flood history. Even more, there are now new generations of people—children, grandchildren, and even great children of survivors—who have no idea the flood happened. As I worked to facilitate a standards-based project with my 6th graders, this is why I chose this particular topic. Arguably, nothing in the last century has impacted the Southern Tier, especially Elmira, more than the flood. To those who lived through it, there was life before the flood and life since cleanup. There was Elmira before and Elmira after the catastrophe. The flood still impacts Chemung County even in 2019. It was a cornerstone in local history and important in the story of who we are as local residents. If we are to keep people here for the future to continue to rebuild and restore this area, we need to teach students about our own history and instill an appreciation for what Elmira and surrounding areas were and what it will be in the future. I am a 6th grade teacher of English and Social Studies at Horseheads Intermediate School. I teach a team of forty-five students. At the Intermediate School, I am fortunate enough to have leadership that supports Project Based Learning. So, this exhibit is the culmination project of this PBL assignment. Students have spent months learning about the flood, researching topics of interest in relation to the flood, and building an informational exhibit that focuses on the impact on different aspects of the local community because of the flood. Students began reading background literature written by local historians such as Thomas E. Byrne, Rachel Dworkin, and Kirk House. Once students were versed in the general history of the flood, research groups chose topics in which to focus on and build this exhibit. Topics included first responders, military and government, hospitals, and more. Groups chose an authentic historical image based on their chosen topic and wrote a short history outlining that particular story. Students used primary and secondary source material such as newspaper articles, journal articles, documentaries, and personal accounts of survivors to tell their histories. Put together, this is a unique story of the flood that is personal, relevant, and highly informative. This museum exhibit is 100% student created. These 6th graders have worked very hard to tell a history that is still vivid to many but unknown to many others. We invite you to come learn about the impact of the flood on our local community in 1972. This student-created exhibit will be on display starting mid-January and we will have an exhibit opening reception on January 30th from 5-7 PM at the Chemung County Historical Society where students and I will be there to celebrate their work and interact with the community. Everyone is invited to attend, free of charge. We hope to see you there! What a great way to inspire your students to learn local history! Thank you for sharing with our community. it was the smell...and the huge piles of people's belongings in front of every home...and mud EVERYWHERE! I remember it well. I was almost 12 years old, and we lived in Southport. We and many others stood at the top of the hill from the "Singing Bridge" and watched the water level creep up. We knew that if it breached where we were standing, it was downhill from there to our homes. We watched in horror as building windows exploded. We would watch them bow in and then out until finally they shattered, and the water rushed in. We saw roofs float by. We saw some cars float by. I spotted a small plank of wood on which sat a frog blinking as it floated by. I had a portable tape recorder and walked around giving my impressions of what was going on around us as if I were a Junior Reporter. I don't know if my parents still have it or not. It was many years and many moves ago. I'll have to ask. Afterward, it was such a mess to clean up. The stench was nearly unbearable in places. Dirt, mud, and other debris covered everything. It was Caveat Emptor to anyone who scored a great deal on a used car in the coming months! Worse was the fact that many people either didn't have insurance, or their insurance didn't cover flood damage as it was an "Act of God," of God" and many people didn't have a rider to cover flooding. 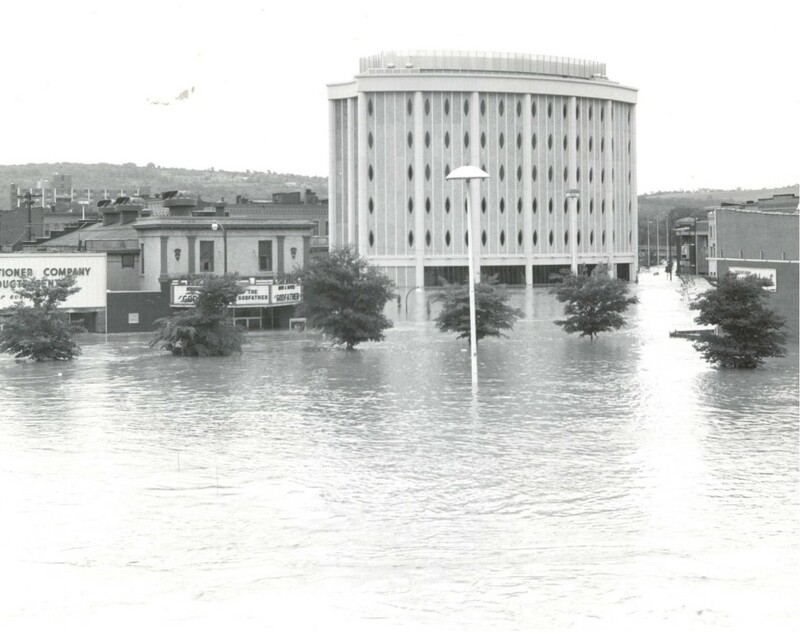 My parents moved us away from Elmira in 1976, but I will never forget that time, and I have many friends and family who still live there, and they can attest to the legacy the flood left behind. I highly recommend the students read “Rat Life “ by local author Ted Arnold.